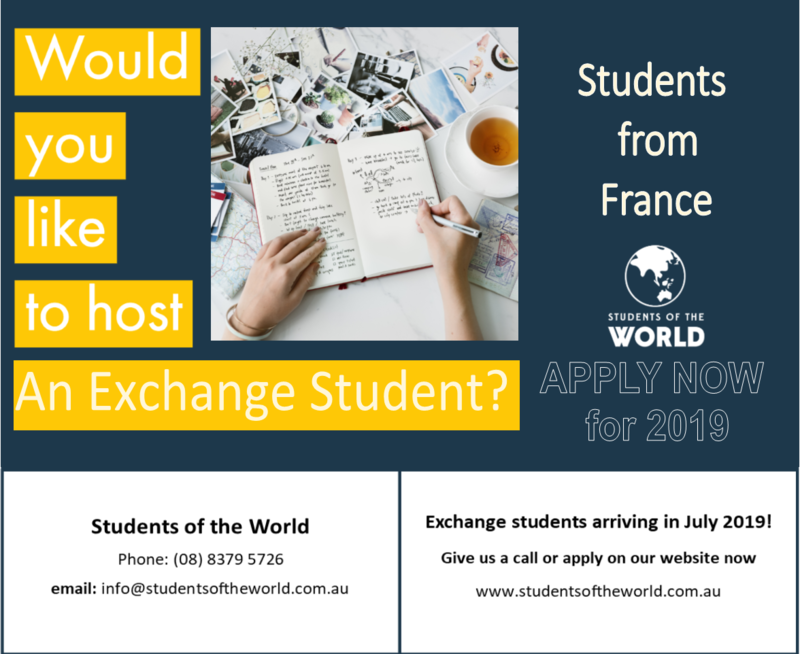 Would you be interested in hosting a French exchange student in Term 3? Students of the World, a non-profit organisation, is looking for a host family to host a student arriving in July. A small donation will be given to the host family and school in exchange for welcoming the student. YES! You get to select the student that you think will fit in best with your family. Student will attend Glasshouse Christian College and Students of the World organisation will arrange enrolment. Students will attend school full-time during their stay. First and foremost a welcoming environment, meals and a room (shared or otherwise). Students have their own spending money and insurance. In return, your family will make friendships and memories for life. Depending on the length of the stay. To express your interest in hosting a French student, please contact Tuija Hast (tuija.hast@glasshouse.qld.edu.au) for further information. This entry was posted in Community News, Whole of School News on April 1, 2019 by sandy.